Great Videos! Thanks for posting. Now if I can keep my German colors straight . . . I have Elsawin, which i have slowly learnt, The only part that i cant understand is for some earth circuits it says for example 410. Earth connection 1 in main wiring harness, do you know how to find this earth location,, Where as you know most regular earths on the diagrams such as 605 tells you where it is located,, on top of end of steering column. but where is the earth when for example it says earth connection 1. If you are able to isolate the wiring from the battery supply/ECM's to allow a safe check of the wiring, then use the ECT 2000, Google it and watch a video demo of it in use, when you get used to using it you will find electrical testing much quicker. 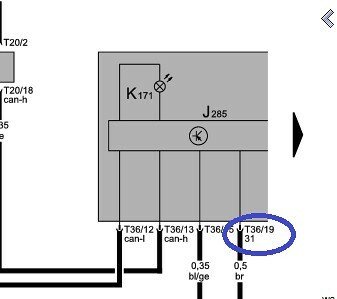 When I put the Gold R32 cluster, into the Touran, the outside temp sensor, fuel sender earths and coolant level sensor etc had NO earth - however, does the diagram above, mean that pins 19 AND 31 should be earthed? The Touran ONLY has an earth on pin 19, Does the Golf cluster require one on pin 31 too, and that would provide the earth to these sensors? I currently have the sender earth connected to a chassis earth, to get these sensors working. This is the ONLY time, I have seen this on a diagram... though I have found a couple of mistakes in the diagrams I'm using fo the R32 Touran conversion. I must say, I've worked a LOT with Subaru diagrams too, and they make MUCH more sense to me! Last edited by NZDubNurd; 09-13-2016 at 02:46 AM. Reason: Apparently my S key is a bit dodgy! and the control of my fingers! Here pin 19 is number of pin. "31" is "label" or "meaning" what is this pin for. Japanese diagrams are build using different principles. I thought that too, like the can-l can-h etc. Weirdly, it goes from pin 19, to earth connection 367, and to the earth point at the top of the steering column. Just seems weird to have a label! NZDubNurd: I agree that VW's nomenclature on WD is arcane and certainly not intuitive, but your circled pin does make sense if you make reference to DIN 72552 (which is itself an arcane document, but one that is widely used in European vehicles in general and German cars in particular). The mysterious "31" in your circled part of the wiring diagram means "Terminal 31" - which is defined in the "Battery" part of the DIN standard and it means "return to battery- or direct to ground"
Last edited by DV52; 09-13-2016 at 05:38 PM. it means "return to battery- or direct to ground"
...except I haven't seen it ANYWHERE else in these diagrams, and I've probably spent 300 hours processing them... some of them are memorized! I've probably spent 300 hours processing them [WD s]... some of them are memorized! I only wish that someone had told me this fact when I was young, so I could make-sure that the "lower" memory address locations were filled with important information - as it was, my early interests were focused on useless stuff like girls and fast cars! So my advice to you (pending the veracity of my assumption of you being "disgustingly young") is don't make the same mistake that I made - Fill those important lower memory address locations in your brain with data that will be useful when you reach my advanced years (hint: WD info isn't a contender)! Last edited by DV52; 09-13-2016 at 08:30 PM. Last edited by NZDubNurd; 09-14-2016 at 01:48 AM. Must be why Einstein stated, don't bother memorizing what you can look up, just know where to look it up.